This is the War and Peace of the ‘War, No Peace allowed’ in one of the Nato-repurposed 2.0 cold war proxy wars against Russia. I know it’s long, but it’s all of a puzzle. Given its length, were I a reader, I’d focus on the Ukraine/Russian warships story, as a hella lot’s gonna break tomorrow, including at the UN. So far Vladimir Putin and Sergei Lavrov have refused to be drawn into responding to threats of war against The Bear, but what might be the flexion point? Given that, I’ve chosen to give some background to what’s afoot already. Yeppers, it’s all copy/paste, but transposing is even more impossible in my haste. On Nov. 25 the FSB had reported that three Ukrainian Warships had illegally entered Russian territorial waters and were carrying out ‘dangerous maneuvers’. “SIMFEROPOL, November 25. /TASS/. Three Ukrainian warships have illegally crossed Russia’s state border entering its territorial waters, and are carrying out dangerous maneuvers, the Federal Security Service’s Border Service in Crimea said on Sunday. “This morning at around 7:00 a.m. Moscow Time three ships of Ukraine’s Navy violated Articles 19 and 21 of the United Nations Convention on the Law of the Sea, which define the right of a coastal state to ensure maritime security, crossed the Russian state border and illegally entered the temporarily closed waters of the Russian territorial sea,” the statement said. 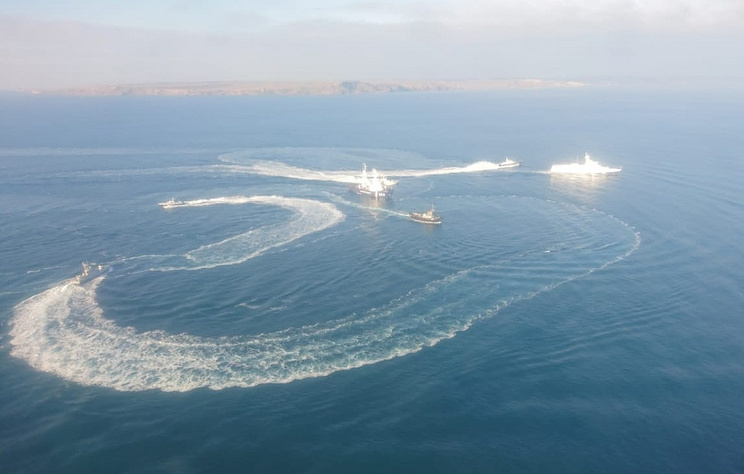 “All three vessels of the Ukrainian Navy, which violated the Russian state border, have been detained in the Black Sea, weapons were used to force them to stop, the Public Relations Center of the Russian Federal Security Service (FSB) reported. According to the FSB, “weapons were used to force the Ukrainian warships to stop.” As a result, all three vessels of the Ukrainian Navy were detained in Russia’s territorial waters in the Black Sea. “Three wounded military servicemen of the Ukrainian armed forces received medical assistance,” the FSB said, adding that there was no threat to their lives. “Both sides have been accusing each other of violating the UN Convention on the Law of the Sea. Kiev argues that it had notified the Russian side in advance of its plan to sail from the Ukrainian Black Sea resort of Odessa to Mariupol, a port on the north coast of the Sea of Azov, a claim that the Russian coastguard denies. 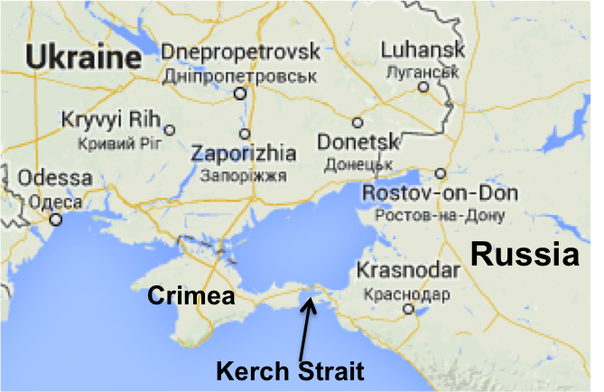 The route goes through the Kerch strait, which separates Crimea from mainland Russia. Kiev has called a meeting of the National Security and Defense Council [NSDC] to discuss imposing martial law, chairman Oleksandr Turchynov told media. “The FSB, which is responsible for maintaining Russia’s borders, denounced the Ukrainian vessels’ actions as a deliberate provocation aimed at creating “conflict situations” in the region. “The existence or absence of the Ukrainian request to the Russians is out of the matter. The fact is that the Ukrainian warships violated Russian territorial waters threatening navigation in the area and provoking the Russian side. More than 5 hours, the Russian side had been avoiding to employ any actions to block warships of the de-facto “unfriendly state” in its territorial waters. The Russian Federal Security Service’s Border Service employed real measures to put an end to hostile actions of the warships of the de-facto “unfriendly state” in own territorial waters at about 20:00-20:30 local time. “Ukraine’s Constitutional Court green-lighted a bill on amending the country’s main law by enshrining into it the final goal of obtaining NATO and EU membership. The decision was announced the next day after the UK and Ukraine’s defense ministries made a joint statement, stressing the need to expand military cooperation. The defense chiefs agreed that Operation Orbital, the Army training program started in 2015, was a success to be continued at least till 2020. Instructors from the British Army, most of who have significant experience in participating in combat operations in Iraq and Afghanistan, have trained over 9,500 Ukrainian servicemen. An unspecified number of UK soldiers would be sent to train Ukrainian special forces and marines, in addition to the 100 personnel deployed currently in the country. A multi-role hydrographic survey ship will be deployed in the Black Sea next year to demonstrate Britain’s support for Ukraine and ensure “freedom of navigation”. HMS Echo is not a warship but it flies the naval ensign. In September, Great Britain made known it planned to increase the warships’ presence in the Black Sea next year with increasingly frequent port calls to Odessa. Nobody in Washington or London asks why an industrialized nation and a large arms exporter, with abundant resources and fertile land should depend on foreign assistance unable to defend itself. Weapons are supplied and training is provided to the country, where corruption is rampant. Even the US State Department’s recent report says it is. Popular protests are commonplace. The conflict in Donbass is used to distract the people from domestic woes. The frustration with Kiev’s reluctance to introduce much-needed reforms and curtail the political influence of the oligarchs is rapidly growing. The common people of Ukraine need political and economic reforms, not increased foreign military presence on their soil. “Russia is not watching idle. If the Minsk accords are washed out, it will have each and every reason to recognize the Lugansk and Donetsk self-proclaimed republics as independent states eligible for military cooperation agreements, including stationing Russian military bases on their soil, if their governments ask for it. No international law would be violated. “We are certain that when Ukraine is completely overrun by neo-nazi leader Andriy Biletsky, the western mainstream media will wonder what could have possibly caused such an outcome. Then again, the fact that Biletsky was invited by Czech MEP Jaromír Štětina to visit the European Parliament may in fact be a sign that Europe is welcoming of neo-nazi elements, as long as they are directed towards Russia. (Oriental Review) – Today’s Ukraine is painfully reminiscent of Germany in the 1920s: poor governance on the heels of a lost war, which – added to the sense of betrayed hopes and the sharp decline in average incomes coupled with rising prices – is all driving a critical mass of the Ukrainian population toward an overwhelming feeling of desperation. A demand from the public for a “strong hand” – a new, authoritarian ruler – is rapidly coalescing, due to their dissatisfaction with President Poroshenko and all the other jokers they’ve been dealt from that shabby deck of political cards. There are about six more feet of text and links, but you likely get the gist. “Israeli arms are being sent to a heavily armed neo-Nazi militia in Ukraine, The Electronic Intifada has learned. “Starting as a gang of fascist street thugs, the Azov Battalion is one of several far-right militias that have now been integrated as units of Ukraine’s National Guard. “Today, Azov is run by Arsen Avakov, Ukraine’s interior minister. According to the BBC, he pays its fighters, and has appointed one of its military commanders, Vadym Troyan, as his deputy – with control over the police. It’s chock-full of photos and videos, tweets, etc. “Israel’s military aid to Ukraine and its neo-Nazis emulates similar programs by the United States and other NATO countries including the UK and Canada. The whole nine yards are here. This entry was posted in africom, nato, empire and war crimes, Uncategorized. Bookmark the permalink. those Ukrainian vessels could have been 5 miles inside Russian waters & everybody in the US would still blame Russia. like N Korea not wanting military exercises off its coast, Russia not wanting foreign military vessels in its waters is a sure sign of malign intent. yup. as to the UNSC convcation, it was called by russia, but in every single piece of coverage, that wasn’t mentioned. it was ‘hysteria! UNSC session called cuz: bad russians fired on ukie navy!’ i kinda live-blogged the comments on their website, and swear to gawd, the UK ambassador added ‘novichok in salisbury’ along with everything else. but see, ‘roosia illegally annexed crimea, so those ain’t their waters nohow’. i’d added some of the wsws commentary on it, and some of it i hadn’t known added even more background as a ‘war-seeking’ confrontation. putin dosn’t even seem aware of that, he put it down to kiev/poroshenko wanting to mess up the elections. but his quote at RT today were purdy funny, on the order of ‘kiev could kill babies, the world wouldn’t mind, as long as ya stuck ‘russia into the reasoning’. wonder why your avatar was the navy and white one for a ew comments, now it’s back to this ish-olive one? did you sign in w/ the same email address? and oh, does nato/kiev hate that bridge, not just for what it stands for geopolitically, but “it cost seventy zillion rubles while the people starve!’ but of course, wsws kinda does some of the same boilerplate disses. Sorry I didn’t get to this until fairly late as I was a bit off-put by NC’s thread on it using the Real News transcript – haven’t really followed until MoA tackled things. I really recommend b’s analysis. Plus comments following on as the various permutations, including the back and forth with the ships and the Russian bridge folk make it pretty clear it was a provocation by the Ukrainians not following established protocol. Interesting comments there also concerning Poroshenko’s establishment of martial law and possible election consequences. but i’d included the funding of, and activities of the azov battalions in ukraine, as well, all of the same puzzle, imo. and i don’t believe as putin does, or pretends to believe, that it’s all about the coming elections. it’s NATO wanting ukraine, as well. Ukraine in the frame for serious crimes against the Russian Federation and illicit a massive military response from Russia. knowledge of the exact nature of the provocations. All evidence currently points to this being a genuine false flag attempt to initiate a conflict between Ukraine and the Russian Federation. 1) THE CRIMEA BRIDGE was targeted. 2)THE UKRAINE / RUSSIA BORDER REGION (DONBASS) was targeted. Contractors aboard a Ukrainian cargo boat (being used as a NATO spy vessel) in the Black Sea were involved in a highly sophisticated and coordinated attack – a false flag event – against the Russian Federation, to be blamed on Ukraine. The Ukrainian cargo boat was carrying at least 2 teams of Contractors, one of whom were divers. They were attached to Ukrainian Forces and other NATO advisors and trainers. The Contractors on this vessel were monitoring a team of patsies that were sent in to the Kerch Strait on an intelligence boat poorly disquised as an old tug boat, and which was escorted by two modern river patrol boats. These patsies were used simply as fodder to create a staged and well planned distraction to the main event to follow. Once the planned distraction was in play, including some very sophisted EW in the form of signals control and a second distraction in Donbass, the Contractors on the Ukrainian cargo boat were to go live and carry out the main event. The main event was the targeting of the Crimea Bridge, actually just a specific section of one particular foundation near the Kerch Strait which would take many months to repair. A major second element to this false flag was for Ukrainian forces facing Donbas to send munitions towards the Russian border whilst other units advanced on Donbas at the same time. This was to be done during the opening minutes of the opening sequence of the Kerch Strait incident. EW and fake comms signals would simulate a major offensive beginning on the Russian border. The distraction in the Kerch Strait would then be amplified by real and spoof comms and signals traffic. This was intended to confuse and temporarily blind the local civil authorities in Kerch (Coastguard and Police) leading to the military to be put on further high alert, generating further signals traffic and confusion. Then with more fake signals transmitted, further confusion, and so on, creating a positive feedback loop of confusion and actual and spoof comms chatter. and within a certain time frame during the weekend. This pre event psy-op ensured the pre-positioning of Russian assets and that a Russian response was guaranteed due to the pre-stressing and manipulation of key targeted individuals. Electronic trails and actual Paper trails were created to confuse Russian Intel. Evidence in the form of written orders was pre leaked, and contrived real and false comms traffic, much of it in real time, was created. Combined signals disinformation in the form of apparent movements of known watched assets, including NATO ships and planes conducting exercise, would provide perceived evidence that an attack was taking place. Pre-named Ukrainian Officials and Military Officers would have appeared to have ordered or were ordering / authorising the attacks on the Crimea Bridge and on an unknown target in Donbas, whilst begging for urgent NATO intervention. At the height of the confusion and distraction the bridge section was to be demolished. This was called the main event. The attack was specifically intended to provoke an immediate military response from the Russian Federation against Ukraine. It is not yet clear how the Russians realised what was going on, but the Ukrainian cargo boat in the Black Sea which was to deploy divers to attack the bridge was fired upon by Russian aircraft using unknown missiles or devices. At least x2 hits on the vessel were registered. Vessel was disabled and multipul injuries reported on board, but vessel did not catch fire, nor was it sinking. Search teams were despatched to Black Sea area where cargo vessel was operating to locate items thrown overboard. Items recovered in just minutes by Russian Divers dropped by helicopter. Bridge also searched by Divers and specialist equipment for planted devices. No devices found. Captured Ukrainan Vessel was towed to Sevastopol. Orders given not to even mention the capture of the vessel or engagement by aircraft of this Ukranian vessel. Ukranian vessel now inside and under 30 feet of concrete away from long lenses and eyes in the sky. Very sophisticated NATO signals equipment now in Russain Possesion. this was staged false flag attack. Usual conspiracy theory defence now in play regarding any talk of Russian aircraft firing upon a Ukrainian vessel or regarding any attempted false flag at the bridge. Spiders ensuring all flies removed from the internet so copy this post before it is eaten by spiders. ·Item recovered from Black Sea by Russian Divers was ‘Compact nutro thermal’ (translation error?) of 0.2 to 0.6KT yeid. Note – In NATO terms this device would be called a SADM. It is a class of nuclear device designed specifically for destroying key pieces of infrastruture. Note – this device is apparently NOT an old soviet or US device but something much more modern and sophisticated called a ‘neutron eating hot burn’ (translation error?) turn up and down (translation error?). Russian communications systems were heavily compromised locally by very sophisticated technology. Number 1 suspect is UK Warship in co-operation with US spy and EW plane tracked in area, but unlikely due to implications. Another actor is suspected. State player (translation error?) currently being watched. Reports that psychological pressure to act irrationally was reported by Coastguard ship crew. Suspect that directed ELF (translation error?) and EWE (translation error?) was used on targeted individuals. Site of transmission of Pre-recorded spoof chatter and spoof signals transmitted so personal communications used by Coastguard tracked to location inside Ukraine. ‘beyond threshold’ attack protocol was known to Contractors to ensure an immediate response by Russia to a nuclear event. The breadcrumb electronic trail was created to show Ukraine to be responsible for massive attacks throughout Crimea and Russian western border, causing the Russian Federation to use ‘Officer in Field Authority’ (do not wait for additional authority from Moscow) to respond immediately. This was the false flag guarantee of escalation. The Russian Federation were expected to retaliate with a counter strike of such magnitude that it would shock the entire World. NEW UPDATES November 28 2018. Confirmation now received that the incident was a complete failure. No damage to bridge and no reports of any very large explosion in Donbas. Confirmation that further provocation in Syria was foiled. Believed linked to False Flag attempt at Kerch. Chatter regarding Salted Shells (translation error?) on Russian Port and simultaneous toy plane strike (drone?) strike on Russian air base was received. Orders now given to Ukraine by NATO. UK and US now in control of regular Ukraine units. Ukraine regime no longer in control. Martial Law will stay in place to allow NATO to integrate military units and resupply with advanced weapons. This situation is NOT over! All sides will useing this as an opportunity to advance their ambitions and consolidate holdings. Skirmishes and blockages expected. Further updates to follow when received.